دیوبند هفشجانی, لاله, هوشمند, عبدالرحیم, ناصری, عبدعلی, سلطانی محمدی, امیر, عباسی, فریبرز. (1395). مقایسه کارایی بیوچار و ورمی‌کمپوست باگاس نیشکر در حذف نیترات از آب‌های آلوده و تعیین شرایط بهینه فرایند جذب. نشریه آبیاری و زهکشی ایران, 10(1), 104-116. لاله دیوبند هفشجانی; عبدالرحیم هوشمند; عبدعلی ناصری; امیر سلطانی محمدی; فریبرز عباسی. "مقایسه کارایی بیوچار و ورمی‌کمپوست باگاس نیشکر در حذف نیترات از آب‌های آلوده و تعیین شرایط بهینه فرایند جذب". نشریه آبیاری و زهکشی ایران, 10, 1, 1395, 104-116. دیوبند هفشجانی, لاله, هوشمند, عبدالرحیم, ناصری, عبدعلی, سلطانی محمدی, امیر, عباسی, فریبرز. (1395). 'مقایسه کارایی بیوچار و ورمی‌کمپوست باگاس نیشکر در حذف نیترات از آب‌های آلوده و تعیین شرایط بهینه فرایند جذب', نشریه آبیاری و زهکشی ایران, 10(1), pp. 104-116. دیوبند هفشجانی, لاله, هوشمند, عبدالرحیم, ناصری, عبدعلی, سلطانی محمدی, امیر, عباسی, فریبرز. مقایسه کارایی بیوچار و ورمی‌کمپوست باگاس نیشکر در حذف نیترات از آب‌های آلوده و تعیین شرایط بهینه فرایند جذب. نشریه آبیاری و زهکشی ایران, 1395; 10(1): 104-116. 5عضو هیات علمی موسسه تحقیقات فنی و مهندسی کشاورزی، سازمان تحقیقات، آموزش و ترویج کشاورزی، کرج، ایران. وجود نیترات در منابع آبی یکی از مهم­ترین نگرانی­های جهانی محسـوب می­شود، بنابراین استفاده از جاذب­های ارزان­قیمت همچون بیوچار و ورمی­کمپوست به عنوان راهکاری در جهت حفاظت محیط زیست و مدیریت بقایای گیاهی از اهمیت زیادی برخوردار است. این پژوهش با هدف مقایسه کارایی بیوچار و ورمی­کمپوست باگاس نیشکر در کاهش نیترات از آب­های آلوده و بهینه­سازی فرایند حذف انجام شد. پس از تهیه بیوچار و ورمی­کمپوست باگاس نیشکر و تعیین خصوصیات مختلف آن­ها، اثر تغییر پارامتر­های اسیدیته اولیه محلول (2 تا 11)، مقدار جاذب (1 تا 10 گرم بر لیتر)، دمای محلول (10، 22 و 30 درجه سلسیوس)، وجود یون­های رقیب (فسفات، سولفات، کربنات و کلر) و زمان تماس (0 تا 180 دقیقه) بر فرایند جذب مورد بررسی قرار گرفت. سپس مدل­های مختلف سینتیک و ایزوترم جذب به داده­های آزمایشگاهی برازش داده شدند. نتایج نشان داد که اسیدیته بهینه (نهایی) محلول برای حذف نیترات توسط بیوچار و ورمی­کمپوست باگاس نیشکر به ترتیب برابر 64/4 و 78/3 بود و مقدار بهینه جاذب برابر 2 گرم بر لیتر به دست آمد. از میان آنیون­های رقیب، کربنات و کلر به ترتیب بیش­ترین و کم­ترین تأثیر را بر کاهش حذف نیترات داشتند و افزایش دما موجب افزایش کارایی حذف نیترات گردید. هم­چنین زمان تعادل حذف نیترات توسط بیوچار 60 دقیقه و توسط ورمی­کمپوست 120 دقیقه بود. حذف بیش­تر نیترات در شرایط بهینه توسط بیوچار (7/73 درصد) نسبت به ورمی کمپوست (48 درصد) ناشی از سطح ویژه، مقدار کربن و ظرفیت تبادل آنیونی بالاتر بیوچار نسبت به ورمی­کمپوست بود. از بین مدل­های سینتیک و ایزوترم، مدل سینتیک هو و همکاران و ایزوترم لانگمویر بهترین برازش را بر داده­های آزمایشگاهی داشتند. The presence of nitrate in water is one of the most important global concerns. Therefore use of cheap absorbents such as biochar and vermicompost is important as a solution environmental protection and management of crop residue. This study was conducted whit porpuse of compare of biochar and vermicompost sugarcane bagasse performance on nitrate removal from contaminated water and determines the optimum conditions for adsorption process. after providing of sugarcane bagasse biochar and vermicompost and determine of theirs characteristics, the effect of different parameter such as initial pH (2-11), dosage of adsorbent (1-10 g/L), solution temperature (10, 22 and 30 ° C), the presence of competing ions (phosphate, sulphate, carbonate and chloride) and contact time (0-180 min) was investigated on the efficiency of absorption. Then, different kinetic and isotherm models were fitted to the experimental data. The results of this study showed that the optimum pH of nitrate adsorption by sugarcane bagasse biochar and vermicompost was 4.64 and 3.78, respectively. Also optimum adsorbent dosage was obtained 2 gr/L. Among the competing anions, carbonate and chloride had the highest and the lowest impact on the reduction of nitrate removal and nitrate removal efficiency was increased as the temperature increases. According to kinetic experiment, equilibrium time for nitrate adsorption by biochar and was obtained 60 and 120 min, respectively. The higher removal of nitrate by biochar (73.7%) in compare to vermicompost (48%) was due to specific surface area, the amount of carbon and anion-exchange capacity of sugarcane bagasse biochar is higher than vermicompost. The pseudo-second-order adsorption kinetic model and Langmuir adsorption isotherm model showed the best fit to the experimental adsorption data. عابدی کوپایی،ج.، موسوی،ف و معتمدی،الف. 1389. بررسی تأثیر کاربرد زئولیت کلینوپتیلولایت در کاهش آبشویی کود اوره از خاک. مجله آب و فاضلاب. 21. 3: ٥7-51. فراستی،م. 1390. بررسی تأثیر نانوساختار نی و پوشال نیشکر بر حذف نیترات از آب­های آلوده. پایان­نامه دکتری. دانشگاه شهید چمران اهواز. فراستی،م. برومند نسب،س. معاضد،ه. جعفرزاده حقیقی فرد،ن. عابدی کوپایی،ج و سیدیان،م. 1392. حذف نیترات از آب­های آلوده با استفاده از نانوذرات نی اصلاح شده. مجله آب و فاضلاب. 24. 1: 42-34. 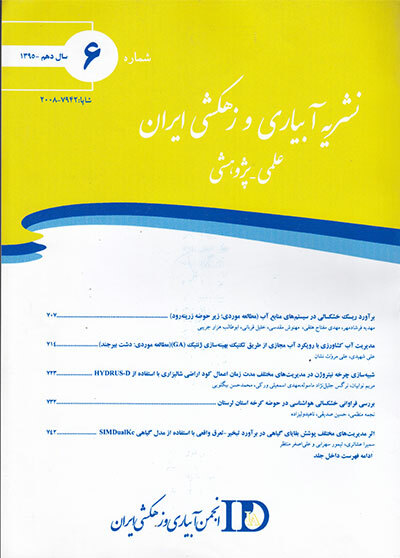 محراب،ن و گنجی­دوست،ح. 1393. پیامد کاربرد زئولیت غنی شده با آمونیوم بر نگهداشت نیترات و آمونیوم در دو خاک با بافت متفاوت در مدیریت کشت گندم. نشریه مدیریت خاک. 3. 1: 30-21. Ahmad,M., Lee,S.S., Dou,X., Mohan,D., Sung,J.K., Yang,J.E and Ok,Y.S. 2012. Effects of pyrolysis temperature on soybean stover-and peanut shell-derived biochar properties and TCE adsorption in water. Bioresource Technology. 118: 536-544. Bhatnagar,A and Sillanpää,M. 2011. A review of emerging adsorbents for nitrate removal from water. Chemical Engineering Journal. 168.2: 493-504. Bhatnagar,A., Kumar,E and Sillanpää,M. 2010. Nitrate removal from water by nano-alumina: Characterization and sorption studies. Chemical Engineering Journal. 163.3: 317-323. Cengeloglu,Y., Tor,A., Ersoz,M and Arslan,G. 2006. Removal of nitrate from aqueous solution by using red mud. Separation and Purification Technology. 51.3: 374-378. Chintala,R., Mollinedo,J., Schumacher,T.E., Papiernik, S.K., Malo,D.D., Clay,D.E., Kumar,D.E and Gulbrandson, D.W. 2013. Nitrate sorption and desorption in biochars from fast pyrolysis. Microporous and Mesoporous Materials. 179: 250-57. Demiral,H and Gündüzoğlu,G. 2010. Removal of nitrate from aqueous solutions by activated carbon prepared from sugar beet bagasse. Bioresource Technology. 101.6: 1675-80. Divband Hafshejani,L., Broomand Nasab,S., Mafi Gholami,R., Moradzadeh,M., Izadpanah,Z., Bibak Hafshejani,S and Bhatnagar,A. 2015. Removal of zinc and lead from aqueous solution by nanostructured cedar leaf ash as biosorbent. Journal of Molecular Liquids. 211: 448-456. Fornes,F., Belda,R.M and Lidón,A. 2015. Analysis of two biochars and one hydrochar from different feedstock: focus set on environmental, nutritional and horticultural considerations. Journal of Cleaner Production. 86: 40-48. Ganesan,P., Kamaraj,R and Vasudevan,S. 2013. Application of isotherm, kinetic and thermodynamic models for the adsorption of nitrate ions on graphene from aqueous solution. Journal of the Taiwan Institute of Chemical Engineers. 44.5: 808-814. Ghani,W.A.W.A.K., Mohd,A., da Silva,G., Bachmann,R.T., Taufiq-Yap,Y.H., Rashid,U and Ala’a,H. 2013. Biochar production from waste rubber-wood-sawdust and its potential use in C sequestration: Chemical and physical characterization. Industrial Crops and Products. 44: 18-24. Haddad,M., Zayed,M.S., El-Sayed,G., Hassanein,M and El-Satar,A.A. 2014. Evaluation of compost, vermicompost and their teas produced from rice straw as affected by addition of different supplements. Annals of Agricultural Sciences. 59.2: 243-251. Halajnia,A., Oustan,S., Najafi,N., Khataee,A and Lakzian,A. 2013. Adsorption–desorption characteristics of nitrate, phosphate and sulfate on Mg– Al layered double hydroxide. Applied Clay Science. 80: 305-312. Harmand,J.M., Ávila,H., Oliver,R., Saint-André,L and Dambrine,E. 2010. The impact of kaolinite and oxi-hydroxides on nitrate adsorption in deep layers of a Costarican Acrisol under coffee cultivation. Geoderma. 158.3: 216-24. Hu,Q., Chen,N., Feng,C and Hu,W. 2015. Nitrate adsorption from aqueous solution using granular chitosan-Fe3+ complex. Applied Surface Science. 347: 1-9. Islam,M and Patel,R. 2010. Synthesis and physicochemical characterization of Zn/Al chloride layered double hydroxide and evaluation of its nitrate removal efficiency. Desalination. 256.1: 120-128. Kaewprasit,C., Hequet,E., Abidi,N and Gourlot,J.P. 1998. Application of Methylene Blue Adsorption to Cotton Fiber Specific Surface Area Measurement: Part I. Methodology. The Journal of Cotton Science. 2: 164-173. Katal,R., Baei,M.S., Rahmati,H.T and Esfandian,H. 2012. Kinetic, isotherm and thermodynamic study of nitrate adsorption from aqueous solution using modified rice husk. Journal of Industrial and Engineering Chemistry. 18.1: 295-302. Masto,R.E., Kumar,S., Rout,T., Sarkar,P., George,J and Ram,L. 2013. Biochar from water hyacinth (Eichornia crassipes) and its impact on soil biological activity. Catena. 111: 64-71. Milmile,S.N., Pande,J.V., Karmakar,S., Bansiwal,A., Chakrabarti,T and Biniwale,R.B. 2011. Equilibrium isotherm and kinetic modeling of the adsorption of nitrates by anion exchange Indion NSSR resin. Desalination. 276: 38-44. Morghi,M., Abidar,F., Soudani,A., Zerbet,M., Chiban, M., Kabli,H and Sinan,F. 2015. Removal of nitrate ions from aqueous solution using chitin as natural adsorbent. International Journal of Research in Environmental Studies. 2: 8-20. Murkani,M., Nasrollahi,M., Ravanbakhsh,M., Bahrami,P and Jaafarzadeh Haghighi Fard,N. 2015. Evaluation of natural zeolite clinoptilolite efficiency for the removal of ammonium and nitrate from aquatic solutions. Environmental Health Engineering and Management Journal. 2.1: 17-22. Olgun,A., Atar,N and Wang,S. 2013. Batch and column studies of phosphate and nitrate adsorption on waste solids containing boron impurity. Chemical Engineering Journal. 222: 108-19. Öztürk,N and Bektaş,T.E.L. 2004. Nitrate removal from aqueous solution by adsorption onto various materials. Journal of Hazardous Materials. 112: 155-162. Singh,R., Singh,R., Soni,S. K., Singh,S. P., Chauhan, U. and Kalra,A. 2013. Vermicompost from biodegraded distillation waste improves soil properties and essential oil yield of Pogostemon cablin (patchouli) Benth. Applied Soil Ecology. 70: 48-56. Song,W., Gao,B., Xu,X., Wang,F., Xue,N., Sun,S and Jia,R. 2016. Adsorption of nitrate from aqueous solution by magnetic amine-crosslinked biopolymer based corn stalk and its chemical regeneration property. Journal of Hazardous Materials. 304: 280-290. Song,X., Liu,M., Wu,D., Griffiths,B. S., Jiao,J., Li,H. and Hu, F. 2015. Interaction matters: Synergy between vermicompost and PGPR agents improves soil quality, crop quality and crop yield in the field. Applied Soil Ecology. 89: 25-34. Tan,X., Liu,Y., Zeng,G., Wang,X., Hu,X., Gu,Y and Yang,Z. 2015. Application of biochar for the removal of pollutants from aqueous solutions. Chemosphere 125: 70-85. Xiang,J., Liu,D., Ding,W., Yuan,J and Lin,Y. 2015. Effects of biochar on nitrous oxide and nitric oxide emissions from paddy field during the wheat growth season. Journal of Cleaner Production. 104: 52-58. Xu,X., Gao,B.Y., Yue,Q.Y and Zhong,Q.Q. 2010. Preparation and utilization of wheat straw bearing amine groups for the sorption of acid and reactive dyes from aqueous solutions. Journal of Hazardous Materials. 182.1: 1-9. Yao,Y., Gao,B., Chen,J., Yang,L., 2013. Engineered biochar reclaiming phosphate from aqueous solutions: mechanisms and potential application as a slow-release fertilizer. Environmental Science and Technology. 47: 8700-8708. Yao,Y., Gao,B., Inyang,M., Zimmerman,A.R., Cao,X., Pullammanappallil,P and Yang,L. 2011. Removal of phosphate from aqueous solution by biochar derived from anaerobically digested sugar beet tailings. Journal of Hazardous Materials. 190: 501-507.